During the Christmas season, Italians eat panettone at breakfast with coffee, between meals with Marsala wine, and after dinner with spumante. Panettone can be toasted and spread with butter or mascarpone cheese for breakfast or used to make a wonderful French toast. Here are three recipes for different ways to serve panettone. These individual cream-filled panettone are perfect for a Christmas morning breakfast, a holiday brunch, or unique dessert. 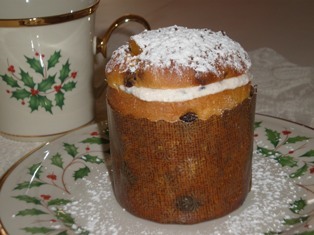 Make or buy mini panettone that are approximately 3.5 ounces in size. You will need about 1/2 cup of cream filling for each one. I used a Traditional Ricotta Cannoli Filling, but you could also use zabaglione, a pastry cream, lemon curd, or sweetened whipped cream filling with some added fresh fruit. Carefully slice off the top 1/2 inch of the rounded top of the panettone and set it aside. Cut around the inside of the panettone about 1/2- inch from the perimeter and 3-inches deep. Don’t cut all the way through the bottom. Use a spoon to scoop out the cylinder from the center. You should still have a thin base of bread at the bottom. Fill the opening with your choice of cream filling. Also spread a small amount of the filling over the top of the base. Replace the reserved top of the panettone. Refrigerate until serving. 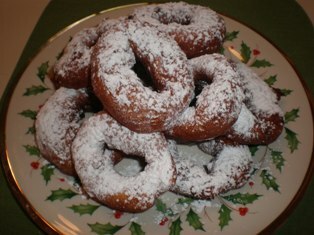 To serve, place on individual dessert plates and dust with confectioners’ sugar. Cut panettone into 12-15 vertical slices, 1-inch thick. Cut the slices in half. Combine the ingredients from the eggs to the cinnamon. Pour into 1 or 2 shallow bowls and add bread to the mixture. Allow to soak 2-3 minutes, turning bread slices once. In a skillet, melt 1 tablespoon each of butter and oil. Add a few slices of the soaked bread without crowding. Cook 3-4 minutes on each side, until lightly browned. Place the cooked slices in a 200 degree F oven, while cooking the remaining slices. Repeat to cook remaining slices. 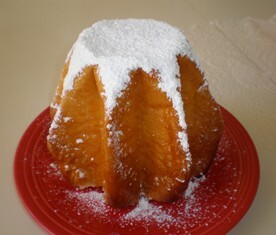 Dust with confectioners' sugar and garnish with orange slices if desired. Sprinkle the panettone slices with rum and Marsala. In a saucepan over low heat, combine the cream, milk, cinnamon, and zest. Bring to a boil, then remove from heat and set aside to cool. When the milk mixture is cool, beat the eggs and whisk into the custard. Butter a deep 1-quart baking dish. Place the panettone into the dish and pour the custard over it. Place the baking dish into a roasting pan. Pour boiling water into the pan so that it comes about two-thirds up the sides of the baking dish. Place in the oven and bake 1 to 1-1/4 hours or until set. Remove the baking dish from the water and set aside to cool. Cover and refrigerate. Run a knife around the perimeter of the baking dish. Invert the dish over a serving platter. A little shake should unmold the pudding. Completed pudding can be garnished with shaved chocolate, sliced almonds, and whipped cream. 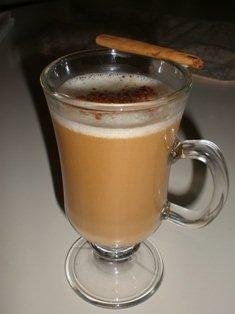 Add some steamed eggnog to espresso and top with grated cinnamon or a cinnamon stick. Steam eggnog with the steamer/frother on your cappuccino maker or use a handheld frother. You can also simply add eggnog to your espresso or coffee as a creamer for a delicious new flavor. The Bauli Panettone is All-Natural and made with simple ingredients: butter, sugar and eggs, along with sweet raisins and glazed orange peels.